A team of faculty and researchers at NC State University were recently awarded a three-year $1 million National Science Foundation grant in collaboration with the Wake County Public School System, UNC-Charlotte and Charlotte-Mecklenburg Schools to broaden participation in computer science (CS) and computational thinking (CT) in North Carolina. Dr. Eric Wiebe, Dr. Dave Frye and Dr. Sherry Freeman from the NC State College of Education’s Friday Institute for Educational Innovation and Dr. Tiffany Barnes from the Department of Computer Science at NC State will lead this project, starting this month, titled EcoCS: Developing a Systemic, Scalable Model to Broaden Participation in Middle School Computer Science Using an RPP Approach. 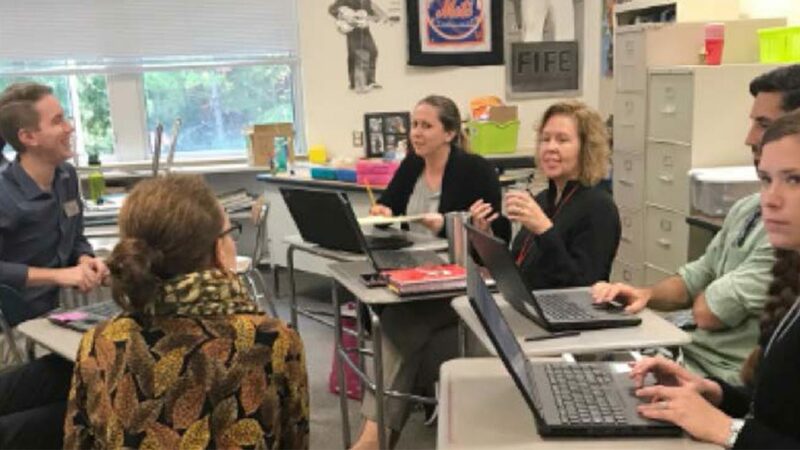 The grant will allow the EcoCS team to expand their work at Wake County Public School System’s Reedy Creek Magnet Middle School: Center for the Digital Sciences in Raleigh, North Carolina. They will work with the newly formed Digital Sciences School Leadership Team, using a research-practice partnership (RPP) approach to deepen the school culture of computational thinking. The past two years laying the RPP groundwork between the Friday Institute and Reedy Creek has been crucial to the success of this project because it works in collaboration with the educators at Reedy Creek instead of simply adding to their heavy workloads. The EcoCS team will also use their model of school-wide CS/CT integration at Reedy Creek to inform the development of an RPP at another newly formed CS/CT focused magnet school, Northridge Middle School, in Charlotte, North Carolina. Staff and faculty from UNC-Charlotte’s College of Computing and Informatics and the Center for STEM Education will facilitate the work at Northridge. The EcoCS team hopes that their work in Charlotte will show them what can and can’t be replicated so they can expand this approach to other schools, which is desperately needed right now in K-12 education. This integration of computational thinking and computer science principles into core K-12 curriculum has been recognized as imperative to fostering key 21st century thinking skills for students entering the future workforce. Unfortunately there is no established pathway or assessment standards on how to infuse these skills into mainstream educational experiences, nor are teachers equipped with the content knowledge to implement these principles into their classrooms. Despite these challenges, North Carolina schools have joined this growing movement to incorporate computational thinking and computer science into mainstream K-12 curriculum. The Friday Institute has brought together practitioners, policymakers and researchers to help develop teacher and school capacity to add these principles to curriculum. Its RPP work with Reedy Creek to integrate CS/CT is just the beginning. This article originally appeared on the Friday Institute for Educational Innovation website.